Day number two of service with the Breckenridge Outdoor Education Center is complete. We all had very different days than we did yesterday. 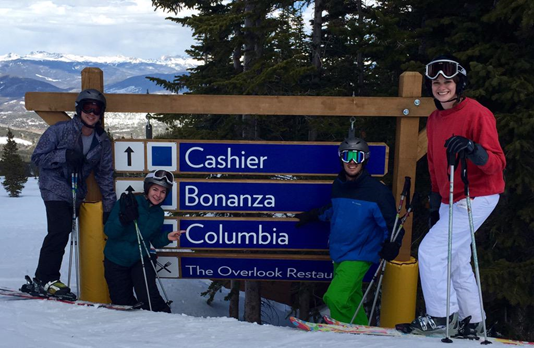 New experiences, students, terrain and instructors made our day nothing short of incredible. The student Meredith and Merrick worked with on a full day, two-track lesson was an eight-year-old girl with Down Syndrome. She was a little fireball full of sass! They were with an instructor named Natalie and she was so great. Natalie has been working with adaptive ski programs for eight years and had a wealth of knowledge about anything and everything skiing. She had to become creative when all of the techniques she tried with the student were not working. Eventually they were able to get the student onto her skis to go up the Quicksilver lift. Natalie tethered the student as she went down the run. Merrick and Meredith followed to keep other patrons' distance and they also took pictures and videos of the student so her parents could see her progress at the end of the day. They only did three runs throughout the day, but they played in the snow with the student and laughed with her. Meredith and Merrick loved their day spent learning from Natalie and the student! Lillie worked with a student who had finally reached "Intermediate" skill level status in his skiing. 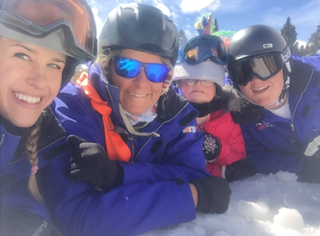 His mother has also decided to learn to ski, and when Lillie and her instructors were commenting on how he can show and help teach his mom all of his new skills, he made a comment that stuck with her and led to great discussion during our daily reflection. He said, "You don't have to be an expert to teach someone". This resonated with all of us in the service we and the people around us are doing every day. None of us are considered "experts" in skiing or really anything else that we may be involved in. But that by no means limits us from teaching others. It also does not limit any of the students we work with each day from teaching us something. I think our entire group can agree that we have all learned from our students during the past two days. We'll never be too old or too educated in something to stop learning, and that is a huge lesson to learn from our service. One of the coolest parts of this experience is that every day is something different for us. We endure a new challenge each day and have something new to look forward to. Today, Kelsey went from working with a very experienced student in the morning, to a student who struggled to stand and stay focused in the afternoon. The diversity found in each student and instructor at the BOEC makes each day a huge adventure and learning experience. So, it is with fatigued legs, heavy eyes and anxious minds that we look forward to day 3!